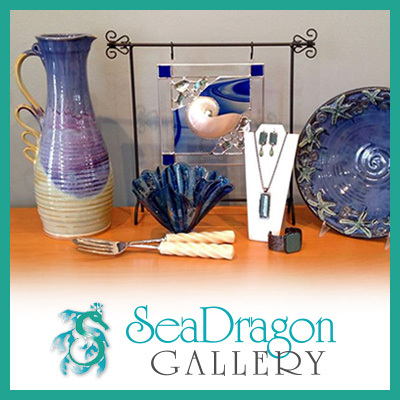 DeHaven Pottery's nesting whale bowls add a touch of coastal whimsey to your kitchen or dining room table. Available individually or as a set. Beautiful circle dangle earrings with purple stones by Christophe Poly. His jewelry is handmade in Montreal, and all wires and hooks are hypoallergenic. Meticulously crafted from estate silverware in sterling and silver-plate, John Marchello's hinged cuff bracelets dress up or down with ease. Owner Eve Turek's color photograph of bald cypress trees in fog at nearby Lake Mattamuskeet won a gold medal for the USA in the World Photographic Cup in 2014. Dancing oval dangle earrings with stones by Christophe Poly. His jewelry is handmade in Montreal, and all wires and hooks are hypoallergenic. The Carolina Blue hues of Larimar will bring you back to the beach in local jeweler Leah Brown's designs. Bracelets, earrings, pendants, rings, all sterling silver. A collection of mini shorebirds by local carver Kerry Reed. How many "peeps" are in your family? Fun bird plaques, each different and with a different number of birds, by local potter Kathleen Redman.